Who's That Roadside Elvis in Addison County? Frequent drivers on Main Street in Bristol, or Route 7 in Charlotte, may have spotted a man parked on the side of the road who sports a black pompadour, bushy sideburns, rose-colored sunglasses, a white dress shirt and black dress pants. 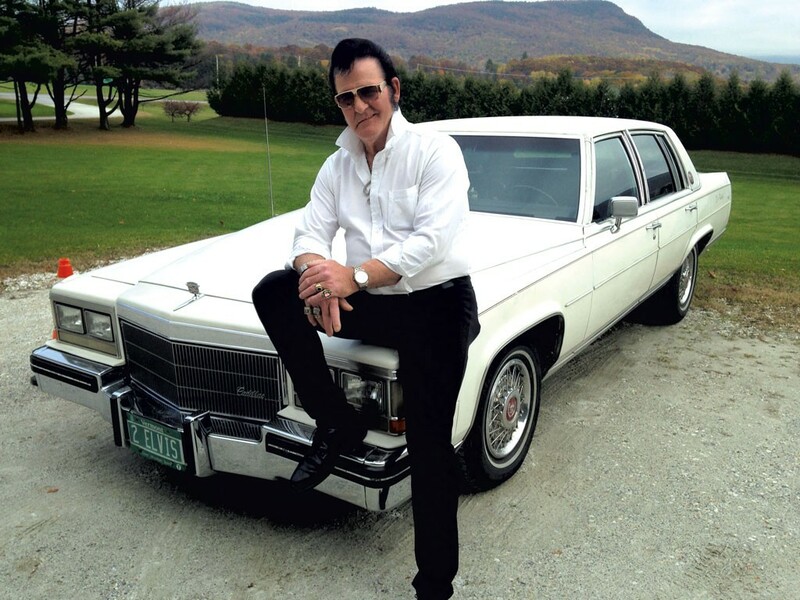 Usually he leans against a white '87 Cadillac with Vermont plates that read "2 ELVIS." If you're lucky, he's got a guitar with him — and might even serenade you. Vermont's roadside Elvis, who's become a fixture in these parts, isn't hawking anything but good-natured smiles. Typically, he spends an hour or two waving at passing motorists, who greet him with puzzled stares, waves and toots of the horn. Occasional tourists or Elvis fans stop and snap selfies with him to show friends that, despite official reports to the contrary, Elvis hasn't left the building. WTF? If you're all shook up, that's all right. That was no ghostly apparition you saw, but Elvis Aaron Presley — just not the one of "Hound Dog" and "Heartbreak Hotel" fame. This Elvis Presley, born Archibald Anderson Elvis Smith, legally changed his name several years ago to match that of his idol — and can show a Vermont driver's license to prove it. The man who would be King and I met last week at his one-bedroom duplex in Bristol, where Presley, 63, lives with his wife of 38 years, Ruth Galvin. Their living room smells of cigarette smoke and features a large fish tank and TV set. No bullet holes in the latter. Not much bigger than a double wide, the apartment is cluttered with Elvis memorabilia, including several 1950s concert posters and glossy photos. Lining two walls are half a dozen guitars along with a banjo, bass and several Fender amps. Presley also has a 1960s-era stereo cabinet that's connected to a turntable, a reel-to-reel player and an eight-track tape deck. "It's also got an AM/FM radio with a white eye that lights up if it gets close to a station," he announced proudly. Presley wasn't born in the Green Mountain State, he said, but grew up in multiple foster homes before being adopted by a family in Salisbury. He's since lived in Tennessee and California, he said, and worked for a time as a truck driver, just as his namesake did. He also claimed to have a brother living in Arizona who looks just like Johnny Cash and is married to a woman named June. A gene for celebrity impersonations? Who knew? Presley said he learned to play guitar at age 5 when a teacher showed him just three chords: D, G and C. "After that, he wouldn't give me any," Presley recalled. "I said, 'Why?' He said, ''Cause you're a natural. You'll learn the rest.' And I did." Presley has since taught himself the banjo, fiddle, harmonica and ukulele, which he plays at VFW halls, local karaoke nights and the occasional high school graduation party. Why the obsession with Elvis? Presley, who spoke with a passable Tennessee accent and the requisite Elvis lip curl, clearly enjoyed telling stories, which grew more colorful the longer I stayed. At one point, he claimed that his birth mother was Lilly Mae Smith, sister to Gladys Smith, Elvis Presley's mother — making the King his first cousin. An online genealogy website indicates that the real Elvis Presley's aunt, Lillian Mann Fortenberry (Smith), was born on January 2, 1906; there's no mention of her having a son. If she really was this Presley's mother, she would have been 47 when he was born in 1953 — a rare occurrence in that era. That was by no means his tallest tale. Presley, who tries to land gigs as an Elvis impersonator whenever he can, claimed that during a trip to Staten Island five years ago, he met actress Ann-Margret and sang "Love Me Tender" to her 97-year-old mother. Later, he asserted that he'd sung "Viva Las Vegas," from the 1964 Elvis film of the same name, while Ann-Margret danced behind him. "That just blew my mind," Presley growled in a southern drawl. But Presley's most eyebrow-raising story involved a meeting with the King himself. He alleged that this encounter, arranged by members of the Presley family, took place years after Elvis purportedly faked his own death in August 1977. In a claim that dovetails with several online conspiracy theories, Vermont's Presley said his namesake changed his name to John Burrows and now works undercover for the U.S. Drug Enforcement Administration. Dubious as Presley's stories may be, there's no doubt that many people, including this reporter, find him entertaining. He's been the subject of many photos and videos posted online. One shows him in downtown Rutland, wearing a blue jumpsuit and standing beside a real hound dog. "I get right up there and bellow it out ... at the end I go right up there, three octaves, and hold it for about nine seconds," Presley boasted. "It blows them away!" Clearly, not everyone worships the King — or this avatar of him, anyway. Passersby have hassled Presley for dressing like Elvis. He claimed that people have even thrown trash at him, and that once, a customer in Walmart pulled a knife on him. His response: "I'm honoring my cousin. This is what I've done all my life. I don't know anything different." Why keep hanging out on the side of the road? "I love giving head trips. I love it!" Presley said with a sly grin. "I'm like Elvis. I'm a kidder, a jokester. I just throw it in their faces and give the people what they want." *Correction, November 9, 2016: An earlier version of this story left out one of Presley's favorite Elvis songs. The original print version of this article was headlined "What's the Story Behind Bristol's Roadside Elvis?"